used as the Main; the other seven breakers can be used as branches to power the loads. The Smart EMS monitors the total amount of current drawn in the RV and automatically controls loads, as necessary, to practically eliminate circuit breaker tripping. The Smart EMS automatically .learns. the amount of current drawn by each of the controlled loads. In this way, the energy manager automatically adapts to differing loads or loads whose current changes with line voltage or temperature.
. Limits total current to 30 Amps.
. Meets NEC section 551-42(c) for adding breakers over the maximum limit of five and allowing for more than two thermostatically controlled appliances.
. Minimizes circuit breaker tripping.
. Eliminates manual appliance select switches.
. Senses current of owner added loads.
. Owner selectable 20 Amp operation (from optional remote panel).
. Protects air conditioners with two minute restart delay.
. .Learns. controlled appliance current draw.
. 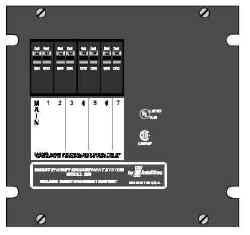 Optional remote panel with Load Status indicators and a digital AC line amp meter.